Dontech, Inc. has introduced Day Vu™ high brightness display enhancement technology, a new development in its Enhanced Display Services (EDS). The Day Vu™ Display Series is a fully customizable product line that includes LED-backlit, actively enhanced displays for direct sunlight readability. 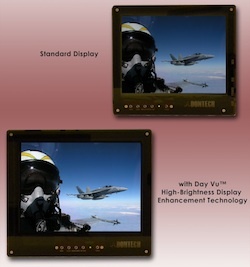 Day Vu™ enhanced displays, in conjunction with Dontech optical filters, provide reliable, bright and efficient operation for marine, military, and industrial applications. Dontech Day Vu™ Series displays offer a typical display luminance of 850 to 1,250 nits and range in size from a 4.1″ to 24″ diagonal. Dontech can configure the Day Vu™ Series displays with touch screens, antireflective cover glass, transparent heaters, and EMI/RFI shielding (ITO coatings or conductive grids). In addition, the Day Vu™ Series displays can be optically bonded by Dontech using its proprietary IMO-bond™ optical bonding process to improve impact resistance and contrast.